Just thought I'd point this out- These 4 currencies are near par with each other: the US Dollar, the Australian Dollar, the Swiss Franc, and the Canadian Dollar. The British pound is the most valuable with the Euro coming in second place among the Western Currencies. Hi Chato, I would recommend going to Dinar Trade in Las Vegas. They would only charge 150 dollars per million dinars and would offer you the best rate- CBI rate (which is the rate given by the central bank of iraq) which cannot be beat. Besides getting the best rate and spread, it will only cost you 150 dollars in fees. Besides, you can celebrate a little in Vegas after you cash out. Great Post. 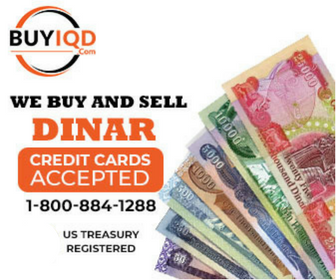 I just recently bought my first batch of dinar and waiting for some more. This was a very well thought-out writing that explains everything for the newbie. Thanks.